The Web browser market has gotten a bit predictable. Leading players Apple, Google, and Firefox have made increased speed and performance their top priority, putting interface improvements mostly on the back burner. And I’ve reviewed two browsers—Yandex and Maxthon—that are essentially Google Chrome with a new coat of paint. All of which makes the decidedly different Sleipnir 4 browser a breath of fresh air. Sleipnir 4—named after the Norse god Odin’s eight-legged horse—seems inspired by Safari. But Sleipnir’s creators have carefully rethought how Web browsers are designed, and wound up with a radically different look and feel. While not all of those ideas turn out well, and other sound innovations fall short in their implementation, I’m still heartened to see designers brave enough to try something new. Keeping Tabs on Tabs: The nifty TiledTab view helps you tame tremendous towers of tabs without even a single click. For good or ill, Sleipnir works off a single theory: You’ll want to open a lot of tabs simultaneously, rather than navigating back and forth in a single view. That’s not quite how I’m accustomed to surfing the Web, but I can understand the concept, and appreciate how Sleipnir’s features flow logically from it. In its most brazen shot across other browsers’ bows, Sleipnir has eliminated the URL bar. There’s a small search box on the right-hand side of the impressively slim controls atop Sleipnir’s window, and a URL above it that you can click to edit or change. But Sleipnir figures that either you’re surfing to places you already know or have bookmarked, or you’re navigating the Web via searches. In place of the URL bar, Sleipnir displays a horizontally scrolling array of thumbnailed tabs. Opera pioneered that idea, but Sleipnir’s tabs remain constantly visible and strike a nice balance between being large enough to identify but small enough not to intrude on the main browser window. Rolling over each tab with your mouse shows the tab’s name and gives the option to close it. 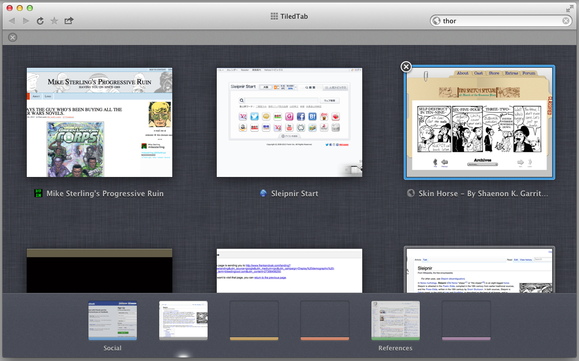 You can also drag tabs atop one another to group them together. Bookmarks: You can only use your bookmarks bar when opening a new tab. 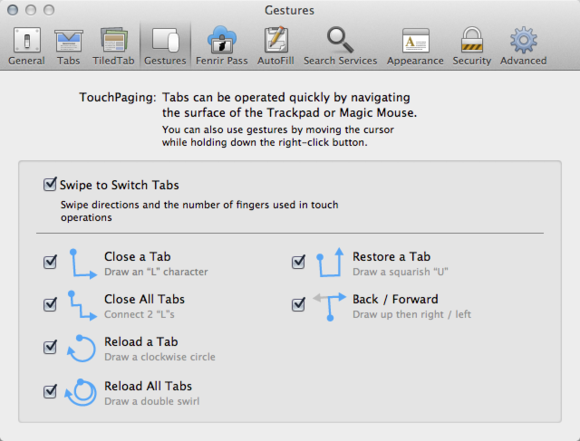 That comes in handy in Sleipnir’s TiledTab view, activated by pinching the main browser window inward (Sleipnir is programmed to work with gestures you can perform on a Magic Mouse or Magic Trackpad). Like Safari 6, the page you’re viewing shrinks into a carousel of open tabs and tab groups. By swiping back and forth, and pinching open and closed, you can switch between various tab groups or pages with one hand, and without ever needing to click. It’s one of Sleipnir’s most useful and well-implemented features. 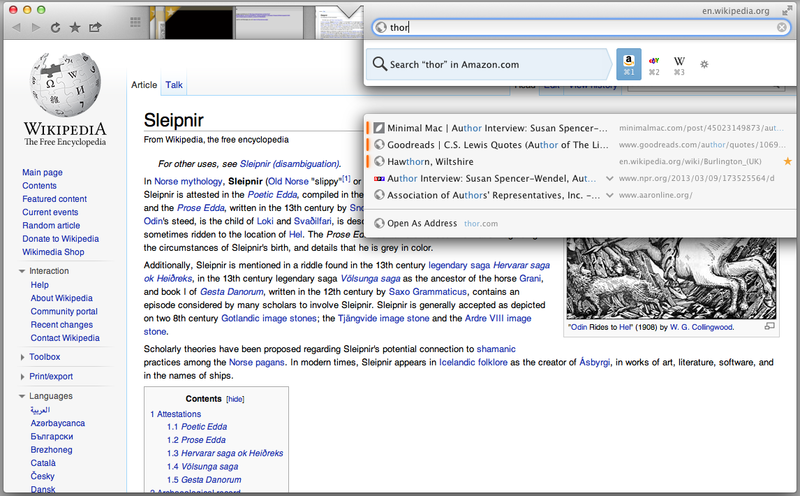 Sleipnir’s search box is also impressive, packing maximum usefulness into a clear, easy-to-operate design. Floating below the main search window, you’ll also see a selection of potential matching pages from your history or bookmarks. This fast, easy way to jump to your favorite sites helps to compensate for Sleipnir’s otherwise frustrating handling of bookmarks. Search: A novel and well-designed search box helps you navigate the web with impressive ease. 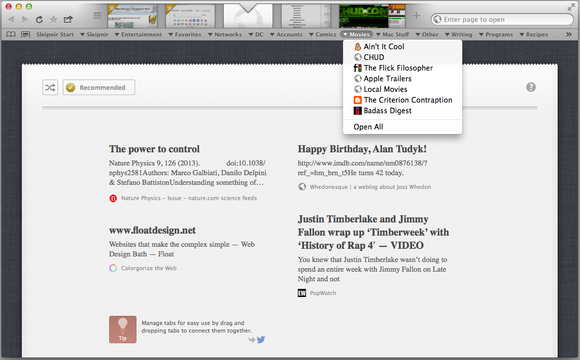 To keep its top navigation lean and clean, Sleipnir doesn’t display the bookmarks bar unless you open a new blank tab. (By default, Sleipnir populates those empty pages with its guesses about where you might like to go, based on pages you’ve visited recently. It’s kind of charming, but not really useful.) If you want to directly open a bookmark or a folder full of bookmarks without opening a new tab or using the search bar, you have to go to the Bookmarks menu at the top of the screen. That didn’t ruin my experience, but was occasionally frustrating. Sleipnir aims to make browsing as simple as possible, so its creators have built in a set of custom gesture controls for basic navigation. There’s no easy up-front tutorial to learn them, unfortunately. You have to hunt for them in the Preferences, where they’re all clearly diagrammed. The gestures work great in theory, but only so-so in practice. I liked being able to close a tab with an L-shaped swipe, reopen closed tabs with a squarish U, or reload a page by drawing a circle. But the gestures worked better on some pages than others. In some cases, they refused to work at all. I had the best luck when drawing gestures slowly and deliberately. Gestures: Sleipnir supports gestures, if you use a Magic Mouse or Magic Trackpad. Sleipnir also assigns the two-finger horizontal swipe—which every other browser uses to go forward and back—to navigating through its list of open tabs instead. To go forward or back in your browsing history, you swipe up, and then to the left or right. This fits with Sleipnir’s tab-centric design, but still takes a lot of getting used to. I would’ve appreciated an option in Preferences to switch how these gestures worked. Gestures weren’t the only place where Sleipnir’s ambitions fell short of its execution. Though it uses the same WebKit engine as Safari, it had trouble properly rendering a few fairly simple pages properly. It also seems bad at multitasking, becoming moderately unresponsive whenever you’re doing anything processor-intensive in one of your tabs. In benchmarking tests against the latest versions of Safari, Chrome, Firefox, and Opera, Sleipnir never ranked higher than the middle of the pack, and often wound up at the bottom. While testing its vector graphics capabilities, Sleipnir choked hard, obliging me to force quit. I like the boldness of Sleipnir’s thinking, and I hope that in future versions, the quality of its engineering catches up with its architecture. If you’re looking for something different, and you don’t need the fastest browser on the block, this dark-horse contender’s definitely worth a try. Editor's note: Updated at 7:30 a.m. PT with benchmark table. Sleipnir 4 is a bold Web browser, and hopefully with future versions, the quality of its engineering catches up with its architecture. If you’re looking for something different and you don’t need the fastest browser on the block, this dark-horse contender’s definitely worth a try.